This Sunshine Solar Flexible Curve 20W 12V boasts ultra pure silicon delivering optimal power conversion. Thin, light and when fitted to the roof of a caravan or motorhome very aerodynamic. 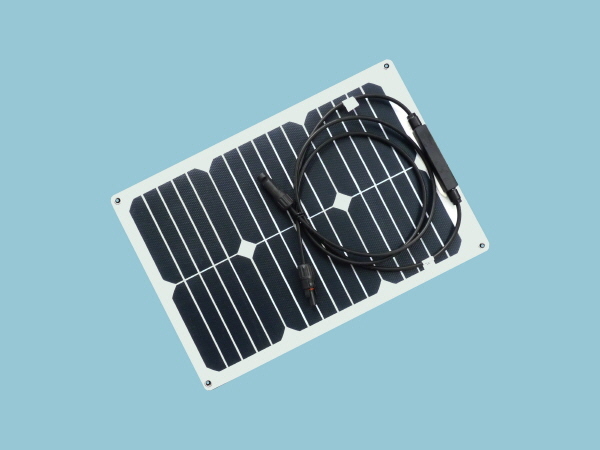 Light weight design combined with high efficiency cells and solar panel flexibility makes our latest Solar Curve range also perfect for marine use and many more applications where a rigid framed solar panel is not an option..
With a Sunshine Curve 20W 12V solar panel you could expect to generate around 5.4 amps per day when used in conjunction with a PWM solar charge controller and around 7 amps per day with an MPPT solar controller during the summer months. Multiple panels can be connected to acquire higher power if needed. Each solar panel is individually tested to ensure that field performance meets or exceeds specifications and this is backed up by a 1 year guarantee for workmanship.